in Mobile Marketing, Search Marketing with tags holiday retail, holiday shopping, Mobile, online sales, retail marketing, search Both comments and trackbacks are closed. This is the final post of a five-part series on ways retailers use digital to make the most out of their marketing efforts around the holidays, and effectively prepare for the year ahead. Many retailers conclude their fiscal years at the end of January to properly account for late December shopping activity and inventory remaining on-hand. The 2014 holiday shopping season is officially in the books – most retailers having recently reported quarterly and year-end results to Wall Street. And it’s a great time to reflect on what we learned. Holiday retail in 2014 brought sweeping consumer behavior changes, much of which indicate the “new normal” in retail and e-commerce. Information is a click away, at home or on the street. And tracking is more difficult as the lines have blurred. 360i helped drive record-setting e-commerce for clients during last year’s “Holiday Hustle.” Across more than a dozen major retail brands, we measured how (and when) consumers browse, discover, research and convert. For the purposes of this recap we focused on paid search behavior – on desktop and mobile – to find valuable insights to apply to our efforts in 2015. What Did We Learn This Past Holiday Season? Online sales for 360i retail clients grew 30 percent against a 21 percent increase in SEM spending. It was finally the year of mobile. Smartphones and tablets reached priority status in budget allocation. 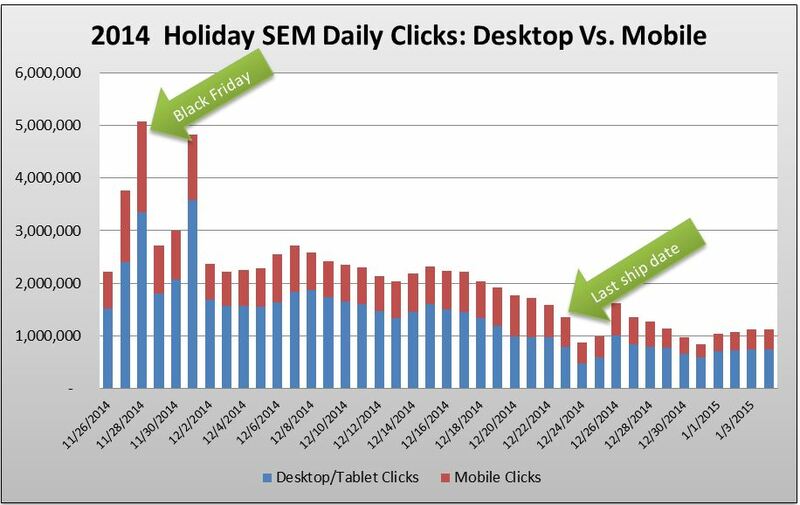 And over a third of all search clicks came from mobile during Black Friday Weekend, holding steady at 25-40 percent of all search clicks for the entire season. Spend on structured data advertising (Google & Bing PLAs) grew 50 percent this past holiday season. Conversion rates ranged from 1.3 to 15.8 percent, while most retailers hover between 2 and 5.5 percent (although that itself is a very large range). Across clients, we saw single digit declines in store sales, even as online sales grew 30 percent, based on approximately 3,700 store locations. While online orders are usually more profitable than in-store sales, retailers with large store footprints need stores to perform, especially given the capital and labor investment. This trend extended beyond our clients, with Macy’s reporting only a 0.6 percent increase in 2014 revenue. Closing 22 stores and opening five, Macy’s followed the typical pattern among department stores, moving into updated shopping centers and away from traditional enclosed malls. The online revenue boom of the 2014 holiday season came at the expense of stores that have not kept pace with the times (i.e., ensuring the in-person shopping experience offers something online cannot). In retail, the in-store experience remains important, as there is no substitute for examining products in person, and return rates on online orders, especially for high-end designer fashion, can run as high as 50 percent. The role of the physical store has evolved, and as such so must marketers’ strategies for attracting and keeping customers. Apparel and footwear can be sized properly in a dressing room. Large home products are inefficient to ship. Fine jewelry bought online misses the in-person inspection process. And despite Amazon’s 2-Day shipping, many products aren’t worth waiting for. It’s also interesting to gauge when searches took place compared to when online buying took place. 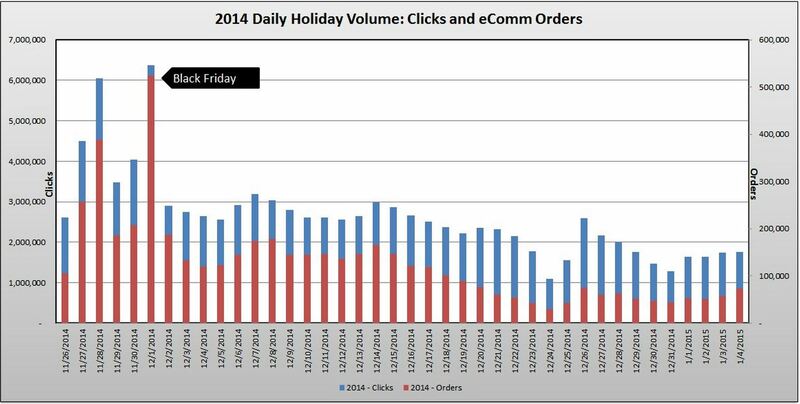 Cyber Monday continues to justify its distinction as the biggest online sales day of the year. Orders nearly equaled clicks, with searches happening days before so consumers could simply direct load a retailer’s website to purchase without going through search. This past holiday season, 360i clients increased spend 20-30 percent on mobile compared to 2013. This pushed mobile to claim over a third of the total SEM budget. When examining the way the desktop to mobile ratio played out, we saw that clearly Black Friday is a day consumers get out of their homes. Weather wasn’t a major factor in the U.S. this past Thanksgiving, and we saw consumers using smartphones to research product availability, directions, pricing and general information while they shopped. Consumers were also traveling to see relatives on Thanksgiving, which meant they were more tethered to a smartphone as their sole information source. Mobile however isn’t a completely smartphone story – trends have show that smartphones are for browsing, and tablets are for buying. Diving into the red portion of the stacked bars above, we would see that smartphones decrease in importance and tablets take over as the holiday gets closer. Purchase device also depends on the time of day and the market. New York City for example has an entirely different profile than Atlanta in tablet versus smartphone usage – making geo strategies in digital media all the more important to have. An additional telling statistic is that click paths have not measurably increased (2.8 clicks in 2013 compared to 2.9 in 2014). This doesn’t however necessarily mean that customers decide more quickly to buy because they are clicking more in aggregate since last year. The shorter click path is because the tracking breaks down as consumers move from one device to another. Cookie-based tracking doesn’t work when a consumer moves from an HP laptop, to a Samsung Galaxy, to an iPad (where the transaction happens) over the course of a couple days. Operationalizing a structured data campaign requires very different workflow compared to paid search, but the results from the holiday 2014 season are quite telling. PLA spending among 360i clients is up 50 percent. Much of the growth 360i clients have driven in PLAs reflect Google and Bing creating more mature auction environments for managing campaigns, thus opening up budget allocation opportunities. But we do see the best results when a single entity oversees search and PLAs. When budget cannot flow quickly from one channel to the other to take advantage of an opportunity, no campaign can fully maximize its efficiency and volume potential. One thing is universally clear: it is important for a clean, linguistically optimized data feed to appear when consumers search. Merchants assign creative names and descriptions to products but consumers aren’t searching for cerise blouses. Comparing the conversion rates of several 360i retail clients indicated most hovered in the low single digits. This is an average for both brand and non-brand keywords in each account. Price points and product categories vary, as does the brand name strength of each retailer. But for all retailers, no other single initiative can drive incremental revenue like a gain in conversion rates. There are well established best practices in experience design and personalization in many other industries. Retailers pioneered online reviews and product suggestions, but retail can be so complex that truly dynamic landing pages can become an elusive target. Retailers contend with overlapping content, including categories and subcategories, lookbooks, designer/label collections, clearance items, seasonal collections, gender, event-driven and countless other variations. It can be difficult to build dynamic templates and decision engines on a dot com site that can amplify conversion, but the juice is certainly worth the squeeze. Improving conversion rates by just a quarter of a point can drive millions more in revenue. One new trend we saw this past holiday season was in creating dynamic landing pages based on keywords searched and applicable search creative that elicited the click. Google has often quoted that up to 25 percent of searches in a day have never been seen before, and yet all require a landing page. When a paid search team lacks an ideal landing page for a search, the best one available is chosen, sometimes through automation. The result is a confusing experience for a user, even more so on a mobile phone with a small screen. Millions of people search broad keywords every day. 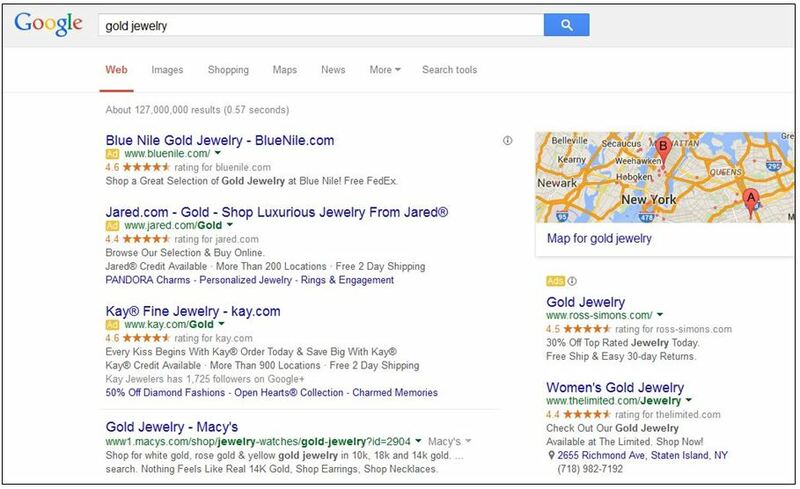 For example, the keyword “gold jewelry” is searched 14,800 times a month, resulting in the above results page for New Yorkers. The searcher has not provided gender, type of jewelry, price range or occasion for the purchase. One paid search ad lands on a page with 8,459 random products sorted in no particular way, another ad lands on a random collection of bracelets and women’s business suits. Yet another decides the searcher must be looking for gold chains and corrals the searcher into a landing page that almost seems to be asking for high bounce rates. The most forward thinking retailers are creating a symbiotic system whereby search informs landing page personalization, and landing page templates are flexible enough to cater to the broadest or most specific, search terms. The front-end click (and promotional offer seen) can be carried forward to the landing page, along with geography and previous behavioral information if the person is a returning visitor. This is also important to store landing pages – each should have a permanent landing page rich with content. A consumer cares about his/her local store, and investors care that a retailer has 1,000 stores. All too often stores in a geographic area are presented to a consumer as a directory and/or list. All the meticulous point-of-sale and merchandising efforts in-store aren’t brought to life in a landing page, instead it’s just a text entry address and thumbnail map to the store on many retailers’ store locator pages. As we pulled the holiday search data needed to inform this series, we reflected on the changing nature of digital marketing and e-commerce. Consumers are searching across multiple devices, making their day or weeks-long pathways challenging to measure to the penny. Consumers are also researching online and buying offline, leaving few breadcrumbs to track for the purchase. Conversely, consumers are researching in-store and buying online. This challenge is really not vastly different than before the Internet when direct mail, catalog and phone centers where notoriously tough to measure against each other. This can’t stop retailers from gut-checking though. Invest more in digital: Digital has fundamentally changed the way consumers shop and convert. It is important for marketers to understand the role digital plays in supporting a consumer’s path to purchase so that digital planning can be evolved and elevated towards a more enterprise-wide solution. Maintain budget fluidity: The most effective holiday strategy is to maintain fluid budgets throughout digital channels and allow performance to dictate investments. Advertisers with multi-channel data can unlock a trove of insights on how their ads work together at macro and categorical levels. Maximize Product Listing Ads (PLA’s): Marketers should clean up data feeds and ensure their media-mix treats text ads and PLAs as the one-two combination punch for Search Engine Results Page (SERP) success. Do not underestimate Paid Social: Social channels are an increasingly essential part of the shopping experience and provide brands many ways to connect with their consumers and influence purchasing decisions. Advertisers have unparalleled opportunities on the platforms to reach their target audiences, customize their messages and create custom experiences for consumers, ultimately forging deeper connections with them and influencing purchase behavior. Understand the role of mobile: Marketers should ensure they are set up to properly invest and support in the mobile tactics and platforms that matter most. Budgeting for drive-to-store initiatives and in-store support, leveraging current customer store sales data for targeting, focusing display on in-app experiences and placements, developing a sophisticated attribution and measurement plan and exploring opportunities using beacons for hyper-local targeting and measurement are all important tactics to consider. Cover photo via Financial Express.